On the 27th – 29th of April BC Motorhomes marketing coordinator, Hayley and her family took the Swift Escape 695 out for an adventure around Ayrshire and the Wigtownshire Coast. We couldn’t have wished for better weather as we toured round in our home away from home! 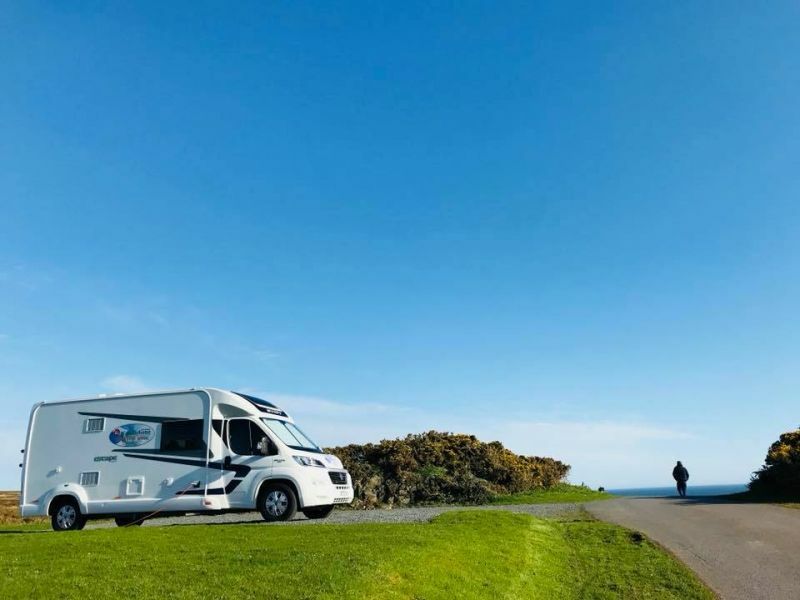 Next stop was to Portpatrick to make camp for the night at The Galloway Point Holiday Park, which is ‘situated less than a mile from the popular unspoilt coastal village of Portpatrick, in the Southwest corner of Scotland. Overlooking the Irish Sea, the Park enjoys panoramic views taking in the distant Mountains of Mourne’. After getting parked up and settled in at the beautiful Galloway Point Holiday Park we went to the pub on site to sample the food, which is child friendly, allowing our son to play in the children’s area while we waited. Now it was time to get settled in for the night and make the beds up. Luckily in the Swift Escape 695 has bunk beds in the back, which are perfect for small children and there is also a double drop-down bed in the lounge area. After a good night sleep, we decided to take a picturesque walk down to Portpatrick form Galloway Point Holiday Park to explore the beautiful coastal village. The path we took passed Dunskey Castle and crosses Taylor`s Peak Bridge above the old Portpatrick Railway line. From here you can take in the beautiful scenery around you before descending a flight of about 140 steps. After a walk around the harbour and various charming gift shops we went for lunch at Campbells, one of the most delicious seafood restaurants with the most amazing choice on the menu! After filling our tummies, we decided to work off our lunch and take the 140 steps back up to the Motorhome and have a cup of tea. The final stretch of our journey on the Sunday took us up the A77 passing the gateway to Ireland, Cairnryan Ferry Port. After that we were treated to stunning views of Ailsa Craig and the Isle of Arran, followed by a quick stop off at Turnberry where the golfers were out in force. Finally, we decided to take the coastal route to Ayr, passing Culzean Castle before arriving back to base at BC Motorhomes. We have thoroughly enjoyed our time away in a rental motorhome - a great way to spend the weekend with your family!